Reconstructing linguistic phylogenies – a tautology? So I thought I should begin my first post on here with a nice and gentle introductory sentence, but I realise that pointing out the increased use of computational phylogenetic tools on cultural and particularly linguistic data to the avid readers of this blog is probably a pretty pointless exercise. There is of course a lot to say about parallels between biological and cultural evolution, and some of the work using computational tools has given us new insights into yet unanswered (and even hitherto unasked!) questions regarding language and language change. But today I’d like to share some thoughts on a particular “application” of phylogenetic tools, the methodology of which I find a bit odd, even though it is arguably the simplest evolutionary analogy of them all: using computational phylogenetics to reconstruct linguistic phylogenies. 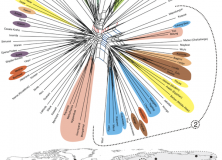 Author KevinPosted on 25 November, 2011 Categories Evolution, Linguistics, ScienceTags categorial particularism, cognates, comparative method, historical linguistics, linguistic reconstruction, methodology, phylogenetics, research6 Comments on Reconstructing linguistic phylogenies – a tautology?